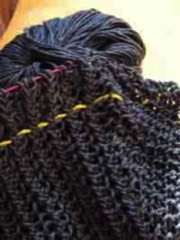 Yarn overs are fun, easy to execute and add wonderful interest. They are also difficult to repair when you make a mistake and have to rip back. That's why we recommend using a Lifeline. Adding a Lifeline is easy. Just use a tapestry needle to thread a spare length of smooth contrasting yarn through all live stitches on the needle (but not the stitch markers). If you have to rip back you have this safety net to pull back to - your stitches will all be safely on your Lifeline. Insert a Lifeline as often as you like - if everything has gone as planned you can pull out and re-insert the same length of yarn as you go along. Life happens - even to experienced knitters so give it a try, you may be glad you did.